What a story, that bottle is a survivor ! looks like them thar dam blog fell asleep, where be you people ? Where be oldcutters with his quick comments ?? Awesome story! Amazing that bottle has been out in the hobby for so long,and could have easily been lost to oblivion by this point. I must admit though I am getting a bit "Clubhoused out". Maybe just me. M.E. Hey G.O. I believe the "goat" is a M. Kreiss S.F. beer. I may have the spelling wrong, but it may actually be green...in any case, it would give the Clubhouse a run for the money, and is supremely killer as far as Western rarity. M.E. That's quite a story and unbelievable odds that bottle survived. Phil is a true collector and a great guy and the longest Club House member. It's interesting to know the provenance of bottles on an individual basis which to me only adds to their desirability. 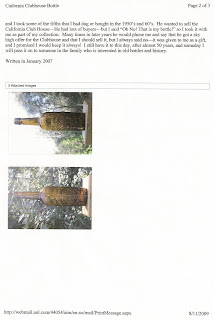 There's some great stories to be told about how and where bottles have been found. They all have a story and it's to bad when the story has been lost. I feel it's important to document the history of your bottles. One of the best stories I've ever heard was the one about the piano. I goes something like this: In the 1870s a family moved from San Francisco to Portland Oregon taking with them all the furnishings of their S.F. home including a piano. The piano sat in the Portland family home for generations since it's move. Sometime in the 1970s the family called the piano doctor for a little check-up and tune. Upon opening up the back of the piano the tuner discovered a green "Cassin's / Grape Brandy / Bitters" that had been stashed there for over 100 years! Actually, the "Goat" is the M. Kreiss beer from Redwood City, very close to Don and Phil's residence. As I recall, the bottle is a medium amber, and not at all the "green" that is so coveted these days. Major Kudos to you, Sole Agent, for putting into print the "rest of the story" about that extraordinary bottle. The fact that it will remain in the family is a testament to a true collector. This is a WHISKEY blog, and the Clubhouse is the top whiskey. It is also the first time one has ever come up for auction. Pls remember that. I cant see how any true bourbon afficianado, could ever tire talking "Clubhouses" ! Now's the chance to actually get one too !! I dont see how someone can compare the Goat Beer to the Clubhouse. That's apples and oranges. There is a beer blog link over on the left side of the page. Thank you. Yes, indeed, a fine emotional response, Anonymous. I suppose that visiting the "beer blog link over on the left side of the page" isn't a bad idea. Maybe a break to a site where common sense prevails will be good. Have you hugged your Clubhouse today? What an amazing story for any whiskey find. Even if it wasnt a Clubhouse, it would still be a great story. Now I fully understand why Phil didnt want his Dad to accept any of the outrageous high offers that he received over the yrs. The Cassin story is rooted in truth, although the details related in this blog have been dulled by time. Here's the "rest of the story". We moved to the Rogue Valley back in 1975, just out of San Jose State, on a youthful whim. We rented a dump in Medford at first, because it was the only place that we could find on short order that would allow us to keep or black lab. In no time, we became acquainted with a number of local collectors. We bought a little place in Ashland in early 1976 and soon met more collectors. About that time, we were introduced to Marvin and Helen Davis who, back then, lived in Eagle Point. They were pioneer bottle book authors and through the help of a photographer friend of theirs named Terry Skibby, produced one of the nicest early books on antique bottles. Antique Bottles was published in 1967. It was a glossy 67 page book in full color. Amongst the whiskies, meds., cures and beers and what have you, were pictured a number of bitters that were in two local collections; and a green Cassins that belonged to some folks in Ashland that they were acquainted with. We were introduced to the owners of the Cassin and were told the complete story about the piano and that particular Cassins. They lived in a big old place above the boulevard. The piano had been shipped to Ashland well prior to the turn of the last century and had always played well. When the owners moved the piano from one end of the room where it had been located forever, to another location in the room, one of the keys suddenly began to produce a clanking sound. Thinking that a string had, or was about to break, they called in a piano tuner. The piano tuner opened up the case and found the Cassins partially resting against one of the strings. The bottle was removed and the piano resumed playing as it always had. The bottle sat undisturbed in the window of the home for many years; out of sight / out of mind. When Davis book was published the word got out about the bottle and when Wilson published Western Bitters in 1969, the cat really got let out of the bag. Soon, they were being hounded unmercifully by any and everyone with two nickels to rub together. That was about the time the bottle went into the safe deposit box. By the mid eighties, I had assembled what most would consider a respectable collection of western bitters. I'd purchased the Scoville collection, which is where the bulk of the bitters in the Davis text had been when the book was written. I'd also purchased the Langley collection, which is where the rest of the power in the book had been. In fact, the only bottle pictured that I didn't own was... the Cassins. I made a couple of runs at the bottle but they wanted to keep it in the family and had no desire to sell. I stayed in contact with the owners and we often talked at length about the bottle. Later on, I managed to put together $5K, which was a respectable amount for any bottle back then. It may as well have been a five dollar bill as fortune had shone on them and they neither needed or wanted the money. Killer story KY Gem. Thanks for sharing it !! We've all been there at one time or another trying to get a killer bottle from a non-bottle person and get close,,, but no cigar. I'm with AP on this one KG. 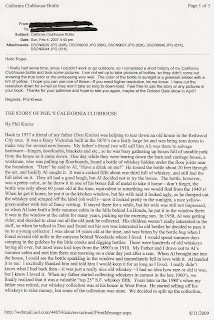 A seriously interesting story and it demonstrates the extremes that collectors will go to "capture" the most elusive bottles. It is sad that it didn't stay in OR, where it "belonged", but instead was purloined by a Californian. I suspect that the heavy freight he paid was only a small percentage of what that Cassin's would garner today. On the "killer bottle" subject, one of my neighbors has a smokin' yellow, applied top, half pint Brickwedel sittin on top of an amoire, just waitin' for the cat to topple it. Not a collector, he has declined to sell it to me. He's one of those guys that gloms onto something just because someone else shows an interest in it. Oh well, one of these days. I've done well in many cases, and failed miserably at others, when it come to using the silver pick (cash in hand), over the years. To me, courtesy and ethics rule supreme when chasing a bottle, regardless of whether it is already out of the ground and owned by someone else or whether you are digging with a novice who has no idea of scarcity or value. I've not done well during the feeding frenzies at shows when fresh blood enters the water. I've got long arms and sharp elbows but prefer not to use them. My loss, others gain, I suppose. Fortunately my impression, based on four plus decades in this hobby, is that most others share the same values. Keep at it Mike, hopefully a time will come when he feels that you have worked hard enough where you deserve it...it certainly cares little for the monetary aspect, he is driven by having something someone else wants. A couple of years ago, my wife was seing one of her new clients in extreme Northern California. As she was concluding the business portion of her meeting with the retired lady, she looked in the china cabinet, and saw a few bottles...a soda or two, a druggist, and an amber pint flask. Upon closer examination she was holding a beyond hammer whittled massivly globby topped pint Brickwedel in mint condition.My wife knew it was a bottle that I would appreciate, and for quite a few months, the lady would not sell that flask at any price.I was kept out of all of it, but she did ask me one day what a brown S.F. flask was worth that said "Brick..something" I assumed she saw a pint toolie somewhere, but I was not super enthused as I collect only applied top stuff.I did say that if it was an applied top, I would fork over major dollars. Apparently one day the lady called my wife, and said to come get the bottle! The price paid is unknown to me, but it was my anniversary present from her. I believe that the lady had been offered a four figure price at one point by my wife, but the deal ended up being done for a fraction of that. The bottle is extremely rare, and beautiful. I do not think there is a price that I would sell that flask for today. I sent Roger a picture of the flask, and perhaps sometime he will post it. It is fun finding a "new" example of something special that has sat unknown in a china cabinet since being dug up in a basement 50 years ago. M.E. Now, that's my kind of story, Dale. A happy ending always hits the "soft spot". The Clubhouse may of not met some expectations but I think it did well considering how plain it was. There once was a time when many bottle collectors would value any example almost equally just to say they have one but for most I think those days are gone. I'm sure the hammer price would of been higher if the bottle had any character. Still what a great highly desirable bottle.